Aïoli is a gorgeous garlic sauce from the Maree brand in France. Lovely with patatas bravas, steak and Hake. This garlic mayonnaise with Pimento is also from Maree. De rouille is perfect with fish and essential to complete a fish soup. Dutch ketchup made together with Kenyan tomato farmers, where – besides the excellent taste – sustainability and a better quality of life for the local community in Kenia are guaranteed. A sauce with a cause! A finely grated horseradish from Kuhne, ready to use and tastefully refined with mayonnaise. It is ideal for seasoning sausage, meat, fish and for in sauces and salads. The Orco brand is over one hundred years old and hails from Varese in Italy. The anchovy paste is easy to use and tastes sublime. You can spice up a sauce with it and it is also delicious on toasted bread with fresh tomato and some mayonnaise. This dried hard roe is from the mullet caught in Sardinia. Thinly shaved over pasta this is a true delicacy. This preserved fruit with mustard seed from Italy is both spicy and sweet. Lovely served to accompany cheese. Goldstar Deli has been making the loveliest condiments and preserves since 2016. The vegetables and fruit that are used are grown and harvested by the Goldstar team from a kitchen garden that is on the banks of the Rhine. Goldstar Deli’s motto is: there are enough tastes for the faint hearted already; Goldstar Deli flavours with spice and Joie de vivre! Use the Goldstar Deli products on your sandwich, with drinks, in a salad or as a snack. Fresh piccalilli with crunchy vegetables. Due to popular demand now also available in a large jar. A spicy and punchy harissa, nice with couscous, merguez sausages or on a Dutch sandwich with cheese. The jalapeño peppers are fermented which is what gives them their extra punch. You can eat this salsa with Mexican dishes, everything which comes off the barbecue or with your toasty. These walnuts are as British as Queen Elisabeth’s hats. These nuts are traditionally picked on the longest day of the year, and are supposed to be eaten on the shortest day of the year. After first fermenting the nuts and then preserving them in a spicy vinegar these walnuts belong to the ‘something else’ variety. Pickled walnuts are irresistibly good with a nice Stilton or another blue cheese. Tip: throw a few pickled walnuts in a beef stew. Success is guaranteed! Little onions preserved in balsamic vinegar. Lovely served beside drinks or in a salad. Thé Korean taste maker. Kimchi is a fermented Chinese cabbage which you can eat with any Asian dish. A hotdog with a little kimchi is also scrumptious. Tip: try some kimchi in an omelette. The taste sensation is sublime. A relish made with slowly stewed red onions. The of this relish taste is soft and sweet, lovely on a hamburger or with grilled meat. 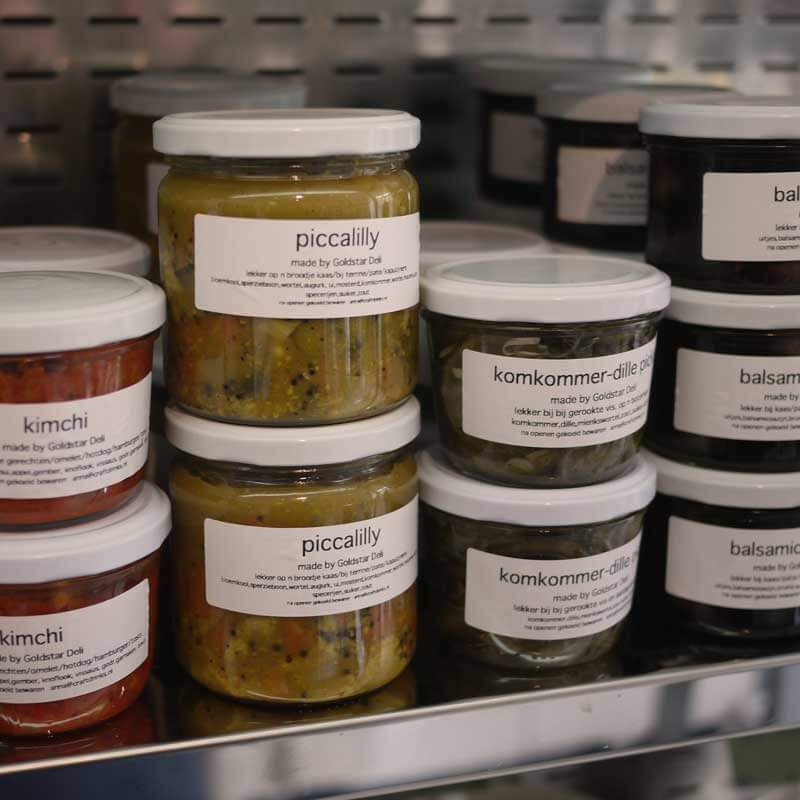 In April and May Goldstar Deli makes the most delicious gherkins, preserved with horseradish and dill.